Yesterday, Robin of Saving Stories posted an article on the We Contribute blog titled Confederate Citizens File. These records are mostly alphabetized vouchers that show goods furnished or services rendered by private citizens and businesses to the Confederate government. These records are digitized on Footnote.com. After reading Robin’s article, I surfed right over to Footnote to check out this collection. Robin had found info that documented the slave owner of one of her ancestors, and I hoped to do the same. I searched in the Confederate Citizens File using the name Taliaferro and then added Georgia to narrow the results. After clicking through a few documents I found several for an “E. M. Taliaferro”. I recognized the name immediately. E. M. is Edward Mobley Taliaferro. The Taliferros, Edward and his father Richard lived in Georgia and were the slave holders of my paternal great, great grandfather Miles Taliaferro and his son John Wesley Taliaferro, my great grandfather. 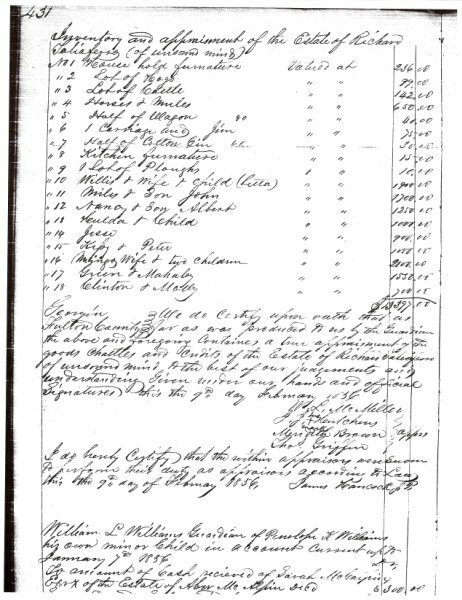 I have an 1856 Inventory and Appraisement that documents Richard Taliaferro as the slave owner of Miles and John. You can see that inventory in this previous post Wordless Wednesday- “Miles & son John”. Wait! As soon as I saw this image I realized I had actually found this document before and it was in my gallery on Footnote. Lesson: Keep a research log and document what you find (and don’t find). I continued to search; I replaced Taliaferro with “Gates” but kept Georgia as a search term. Jack Gates was my maternal great grandfather; he was my grandmother’s father. I strongly suspect his slave owner was Benjamin Gates of Meriwether County, GA. I found records for a Benjamin Gates in Meriwether and Troup Counties. Then I substituted “Middlebrooks” for Gates. Alexander “Alex” Middlebrooks (my great grandfather) was born in Harris County, GA. A possible slave owner is John Middlebrooks and I found a record for a John Middlebrooks of Harris County, GA. Harris County borders Alabama. I believe my Middlebrooks ancestors have an Alabama connection. I saw several records for Middlebrooks in areas of Alabama around and near Harris County. There is no shortage of records to pursue for more clues to possible slave owners. 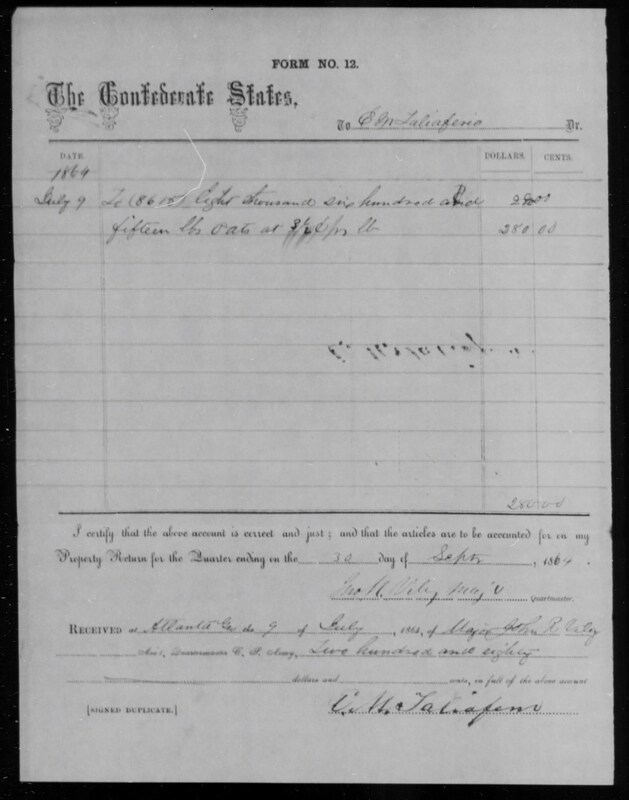 The Confederate Citizens File is a rich genealogical resource. But, it will require patience and persistence to reap the rewards. Several of the records I found mentioned other individuals and referenced additional records that can be checked for further documentation. For example, there was a document for Gates, Benj K of Meriwether Co GA that referred you to the case of Alfred S Greer, and a record for Middlebrooks, John A that referred you to the case of Henry T Huff. These records could hold information that can help me identify and confirm my ancestor’s slave owners. Of course, there is much more research to come before I can document, with any certainty, the slave owners of my Gates and Middlebrooks ancestors, and I continue to look for additional doumentation on the Taliaferro slave owners. The records I found do provide more avenues to pursue before I can add another piece to the puzzle. My thanks go to Robin and her article for leading me to these records, and for motivating me to continue the search to document my ancestors.